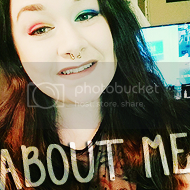 Synopsis: Stella lives with depression, and her goals for junior year are pretty much limited to surviving her classes, staying out of her parents’ constant fights and staving off unwanted feelings enough to hang out with her friends Lin and Katie. 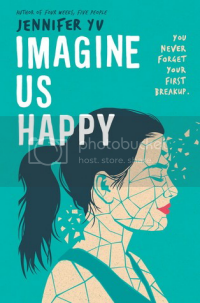 Imagine Us Happy is the story of a toxic/mentally abusive relationship between two teens with depression. Stella and Kevin are both living with depression and both dealing with it in different ways. Stella isolates herself as much as possible, while Kevin copes with self-harm. When the two come together, sparks fly. The two begin a relationship and in no time at all, things begin to go south. Kevin becomes extremely possessive and mentally/emotionally abusive. He doesn't hurt Stella physically, but abuse comes in multiple forms. Pretty soon, Stella is pulling away from the only two friends she has and is using Kevin as a crutch for her depression. Kevin does the same, but uses manipulation tactics to keep Stella "in line". All they do is fight with escalating intensity, leaving Stella feeling as if she is doomed to be just like her constantly-fighting parents. • The story jumps from future, past, future, past, present, etc. It is ALL OVER THE PLACE. I don't mind a time jump, but this was a little tough to follow unless you really paid attention, which would be fine...except the story wasn't all that gripping, you know? So, I was constantly losing track of whether I was in the past or the future. • There just wasn't enough emphasis on the mental illness aspect of the story. We know the two teens are depressed and how they each cope, but we also know that neither way is healthy. Stella sees a therapist for awhile, but she stops when things get serious with Kevin. She uses her boyfriend and relationship with him as therapy. Granted, her therapist did warn her against this, but she didn't listen. She's a teen, I get it. Still, in the end, I didn't see any growth from her as a character. She was the same girl by the end of the book and that was disappointing. It was less about either of their mental illnesses than about the toxicity of the relationship itself. I think the author really missed the mark. • The book was just slow, to be honest. I had that niggling urge to skim. • The format. While I wasn't a fan of the past a future layout, I did like that the book starts with the ending. It served to keep the reader on their toes and waiting for the fall. It worked. • It did cover some tough topics, such as mental illness, self-harm, and abusive relationships. I can always appreciate this. • I enjoyed some of the side characters! Lin, one of Stella's friends, was amazing. Loved her. I also enjoyed Jeremy and his girlfriend. Jeremy is a boy Stella is working with on a school project—and also a huge source of jealousy for Kevin—and Jennie is his girlfriend. They are the perfect juxtaposition to the relationship between Stella and Kevin. I think the contrast was needed and a nice move on the author's part. Overall, I think the book could've been better organized. It was barely likable, but I gave it the ol' college try. I think the intentions were great, but the execution didn't hit the mark. If you can look past the misplaced focus on the romance-gone-wrong, perhaps you may like this one. For me it fell a bit short.